The poetry of Felicia Hemans (1793-1835) flourished during the late Romantic and early Victorian period. Hemans’ mother first published a volume of Felicia’s poetry, Poems, in 1808, in order to raise money for Felicia’s education. Later that same year Hemans published another book of poetry, England and Spain; or Valor and Patriotism. Paula Feldman, who studies Hemans’ relation to the literary marketplace, emphasizes that neither of these volumes produced great economic or critical success, but Hemans continued writing and publishing regularly from this point onward (149). Hemans predominantly published volumes of poetry in her early career, garnering her relatively minor success and respect. Nonetheless, Hemans’ reputation slowly grew throughout the decade; by 1820 she began to gain both critical acclaim and public popularity (Feldman 155). Feldman cites letters between Hemans and her publisher, to argue that from the beginning of her career, she was aware of the economic components of publishing and possessed a “desire to appeal to the public taste in order to author a profitable book” (153). As the literary market began to change, Hemans capitalized on the opportunities for financial gain and increased popularity found in periodical publication. Feldman cites ledger books, which reveal that Hemans was the highest paid contributor in Blackwood Edinburgh Magazine and demanded higher pay than many of her more respected contemporaries (149). During her lifetime, Hemans published approximately four hundred poems in periodicals, as well as twenty volumes of poetry (Sweet 1). Hemans died in 1835, but her poetry remained popular and topical throughout the Victorian era and into the early twentieth century (Sweet 1). Hemans’ influence, respect and popularity waned following the rise of modernism, since many modernist writers despised her subjective voice. Marlon Ross demonstrates that these authors dismissed Hemans as “poetess of ‘domestic affections’” (Ross x). However, Hemans’ attentions to the sentimental, emotional, familiar and subjective are the means through which she established herself as both a popular and respected poet during the Victorian era (Ross xvii). “Casabianca,” one of Hemans most remembered poems, was first published in the August 1826 edition of The New Monthly Magazine. The New Monthly Magazine regularly published work by Hemans. She first contributed to the magazine in 1823, and thereafter published regularly for the next ten years (Feldman 157). “Casabianca,” a poem in ballad form, retells the story of thirteen-year-old Casabianca, son of the Admiral of the Orient, who maintains his post aboard the ship during the Battle of the Nile. In the poem, the young boy frantically seeks approval from his dying father to abandon his post. Since the father lies dying below deck, the boy remains aboard the ship and perishes as the effects of war succumb him and cause the ship to explode. The poem is often considered to be highly melodramatic, because of a heroic and sentimental tone that depicts an escalation of emotion to exemplify the boy’s fidelity to his father. The poem uses dialogue to advance the story, similar to a traditional ballad; however, Hemans creates a dialogue between the boy and the threatening fire. Hemans personifies the fire, where the “booming shots repl[y]” (18) to the boy’s frantic calls, in the absence of the dying father. 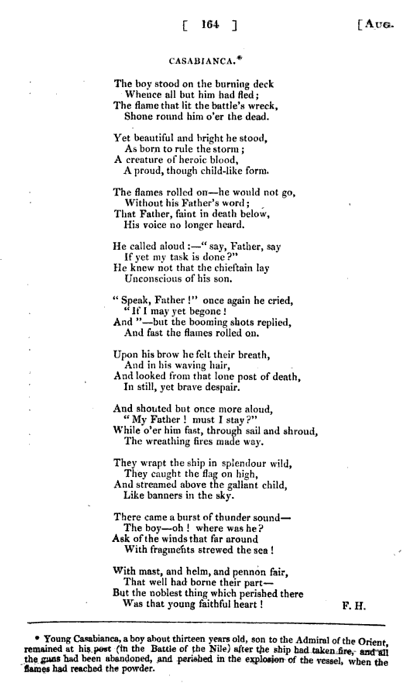 In the final stanza, both ship and the boy are fragmented as a result of the explosion; in spite of this horrific event, the poem closes with a sentimental celebration of the boy’s courageous fidelity to his father. “Casabianca” had a relatively modest audience upon its first publication as New Monthly Magazine had a circulation of approximately 5,000 readers (“Monthly”). But the poem’s subsequent popularity can be measured through its lasting impact on Victorian culture. Poetry recitation became common in schools as a result of changing education laws and “Casabianca” endured as one of the most frequent choices for recitation and memorization (Robson 149). The poem’s exceptional popularity in schools can be attributed to both its form and content. “Casabianca” utilizes the ballad stanza, which is a short four-line stanza where the first and third lines are in iambic tetrameter and the second and fourth lines are in iambic trimeter. This structural component of “Casabianca,” as well as its abab rhyme scheme, made the poem accessible for both memorization and recitation. Likewise, the poem’s subjective representation of duty, fidelity, patriotism, and military conquest asserted the poem as an exemplary image of nineteenth century social ideals. “Casabianca” has certainly outlived its poet; while many people remember reciting the poem in school, for the majority of the twentieth century Felicia Hemans has not been remembered as the popular and respected poet she once was. A notable example is Elizabeth Bishop’s parody, also entitled “Casabianca” (1946). Bishop creates a stark parallel between young Casabianca’s desperation in war and the schoolchild’s desperation in reciting the poem (Robson 148). An examination of the lasting popularity of “Casabianca,” must acknowledge that, while the poem was widely read and well known, the impact of its popularity developed as a result of a distinct historical and social context. Feldman, Paula. “The Poet and Profits: Felicia Hemans and the Literary Market Place.” Keats-Shelley Journal 46.1 (1997): 148-176. Web. 25 Oct 2013. Hemans, Felicia. “Casabianca.” The Monthly Magazine. August 1826. Web. 29 Oct 2013. Google Books. “Monthly Magazine and British Register, The.” Waterloo Directory of English Newspapers and Periodicals, 1800-1900. 2001-2013. Waterloo: North Waterloo Academic Press. Web. 19 Oct 2013. Robson, Catherine. “Standing on the Burning Deck: Poetry, Performance, History.” PMLA 120.1 (2005): 148-162. Web. 25 Oct 2013. Ross, Marlon B. “Foreword: Now Our Hemans” Felicia Hemans: Reimagining Poetry in the Nineteenth Century. Ed. Nanora Sweet and Julie Melnyk. New York: Palgrave, 2001. x-xxvi. Print. Sweet, Nanora and Julie Melnyk, “Introduction: Why Hemans Now?” Felicia Hemans: Reimagining Poetry in the Nineteenth Century. Ed. Nanora Sweet and Julie Melnyk. New York: Palgrave, 2001. 1-15. Print.